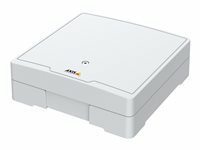 If you need a door controller that can handle advanced access management for a mid-sized, large or multi-site installation AXIS A1601 Network Door Controller is ideal. It's highly flexible and high performing. And just like all Axis door controllers, AXIS A1601 is based on an open platform. Which means you can mix and match best-of-breed software and hardware, and easily integrate AXIS A1601 with your other systems.